Dr. Ron Bell is the Lead Pastor of Camphor Memorial UMC. Ron is married to Dr. Eboni M. Bell and they have two phenomenal sons: Ronald Bell III and David G Bell. Ron’s first passion is music, as a saxophone and guitar player he weaves that love of jazz and reggae into as many worship and preaching interactions as possible. His wife Dr. Eboni Bell is an acclaimed artist, educator, and entrepreneur who is called to empower Youth and Women. 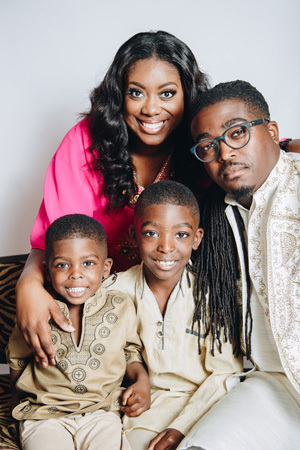 Both Ron and Eboni specialize in engaging Millennials through transformative teaching, worship, and entrepreneurship. The Bell family is committed to serving God and loving and empowering His people! Ron has a Bachelor in Philosophy from Morgan State University, a Master’s in Theology from Regent University School of Divinity and a Doctorate in Ministry from Lancaster Theological Seminary. Ron is a provisional Elder in the UMC.